Today I made a productive low tide visit to Sandy Point in West Haven, CT. Wind was blowing at 15+mph from the SSW ahead of a cold front that would bring strong thunderstorms later in the afternoon. The lagoon mudflats were holding many migrant shorebirds, most notably 9 RED KNOTS and 100+ Semipalmated Sandpipers. 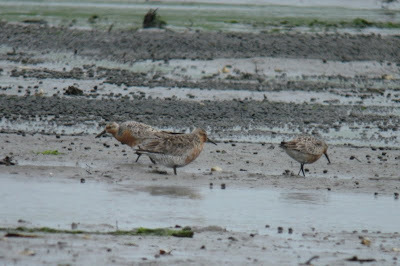 A single Dunlin was also in the mix. Further out the point, beyond the tern colony, a few more shorebirds and gulls were foraging along the water's edge. 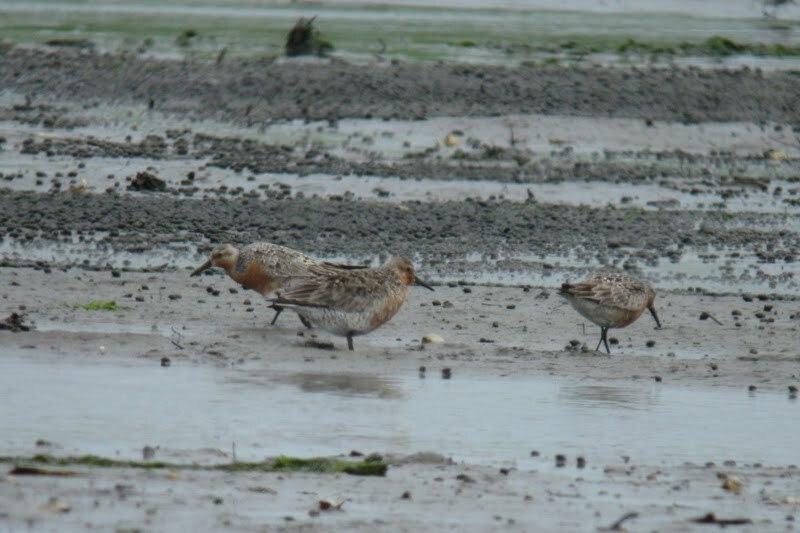 These included 2 Short-billed Dowitchers and a handful of Black-bellied Plovers. While out there I ran into a grad student from U of New Haven who was taking soil samples for analysis of invertebrates, sediment pollution, etc. He said now that much of Sandy Pt is now breached at high tide but Morse Pt is not, the water source for the lagoon is now largely from the harbor side. The harbor itself is more polluted than the open sound. Over the past 1-2 years the amount of pollution in the sediment has increased because of this change in water flow, they believe. Over the same time period they have noticed a shift in invertebrate life from more sensitive species to fewer species that are more tolerant of pollution. This, of course, is poor for biodiversity. One might correlate last spring/summer/fall's low bird diversity with this shift. This spring though, I've seen what I would call typical numbers of shorebirds and terns here. Let's see what happens. Heck, their soil samples may show a reversal of the trends the researchers noted last year. I really should have taken his name and contact info to follow-up on their project. I still might be able to contact him via their website. Very interesting bit on the water source/invertebrates. Thanks for sharing it!